Snowy Egret in the Edwin B. Forsythe National Wildlife Refuge near Atlantic City, New Jersey. Ten miles north of Atlantic City, New Jersey, is the Edwin B. Forsythe National Wildlife Refuge where I spent a morning photographing herons, terns, geese, ibis and this snowy egret. He got me to thinking why I see so many birds standing on one leg. Birds’ legs have an adaptation called “rete mirabile” that minimizes heat loss. The arteries that transport warm blood into the legs lie in contact with the veins that return colder blood to the bird’s heart. The arteries warm the veins. By standing on one leg, a bird reduces by half the amount of heat lost through unfeathered limbs. Birds also purposely create their own shadows in the water. 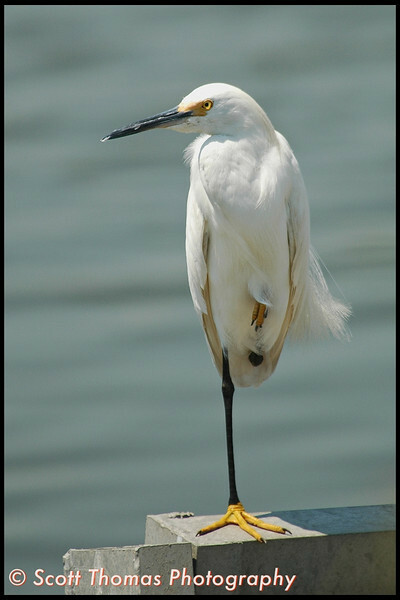 Apparently egrets can blend better with their surroundings and look like a shrub to a fish by standing on one leg. The word “pedigree,” which is one’s family tree, comes from the French “pied de grue” – crane’s foot. This is sometimes represented artistically as a tree with exposed surface roots or even a bird’s foot in old ancestral diagrams. Take a close look at the egret’s legs and feet if you ever get the chance. The tough skin really does make them look like tree trunks, and undoubtedly fools fishes seeking a bit of shade for cover too. This entry was posted in Animals, Nature, Weekly View and tagged atlantic city, birds, new jersey, Photography, snowy egret, wildlife refuge. Bookmark the permalink. 19 Responses to View 34: Why do Birds stand on one Leg? Great shot! Fanciful explanation (but well said). How would one tes such an explanation? Oh gosh! What a great capture! I haven’t yet been able to get a photograph of a egret much less one that poses on one leg! I didn’t know that about birds standing on one leg. Learn something new every day. Anna, this wildlife refuge and others have auto trails. The birds and other wildlife are used to cars slowly driving by. This egret was less than 10 feet from me and took no notice. The fall migration period is coming up, you should check out any nearby National Wildlife Refuges in your area for opportunities. I’ve seen birds standing on one leg for many years and have never thought to find out why. I just figured they were tired 🙂 Thanks, Scott, for the interesting information about the birds. And I certainly like your photos! Scott, I’m going to ‘Blogroll’ you to my blog. Hope that’s okay with you.. Thanks! That’s A-OK by me, Gaye! I’ve added yours to mine. You got some great shots there. I’m hoping for the D700, too! Someday! GREAT shot! I enjoy seeing the snowy egrets. Nice shot. I always saw birds stand on one leg but I don’t know the reasons.Thanks for the info. What a great shot, clear with a perfect lighting, and very interesting info too. Good shot Scott, I like his peering gaze. This entry gets a lot of hits every day. Must be something a lot of people wonder about and google it. This was a fast grab shot with the 80-400VR, too. When this was taken, NJ had flying, biting and large flies which were taking runs at me while I took this and then jumped right back into the car unscathed. Whew! Ever found a place that has nice weather and no bugs? Now that was interesting. I liked the part about standing on one leg to mimic a bush to draw the fish. Well, yeah, but . . . if I were a fish I’d feel like a damfool right about now.